Bali is well-known for its culture and beautiful nature. The culture is exceptionally unique and that you can not find elsewhere. The culture and the nature have a strong relation with Hindu, most Balinese religion. Everywhere you go, you may find many Hindu temples. 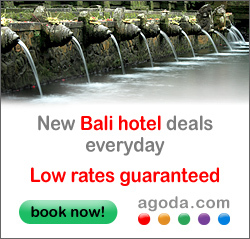 Balinese life is also strongly related with and influenced by culture and religion. This is the reason why Bali is called the Island of God, the Island of Thousand Temples, and the Paradise Island. Kintamani Village is 1500 meters high, the village of Kintamani his a cool, damp climate suited to growing oranges and passion fruit and on market day, which falls every third day, the main street becomes a bustling chaos of vendors, some of whom have traveled from far away, carrying their wares on horseback. It is also called Tanah Let which means ancient land and also Tanah Lot, which means the land to the south.The temple Pura Tanah Lot, simple in its construction, is dramatic in its ocean-front location and is one of the main temples in the worship of Balinese gods. Tanah Lot has a long history in the world of tourism.The temple itself is built on a small promontory which is only accessible at low tide.During high water the rock takes on the appearance of a large boat at sea, such is its shape. "Luhur" means "something of divine origin" while "Uluwatu" can be broken into "ulu" which means "land's end" and "watu" means "rock" in the old language). Nonetheless, merely mentioning Uluwatu will get you here in no time. Bedugul is the name of both a small city and a mountain-lake resort area, which Balinese have long used for weekend retreats. When the heat and humidity finally gets to you, the place to escape to is Bedugul, Bali's highland retreat, tucked into the crater of an extinct volcano, 1400 meters above sea level. Here, three lakes provide everything from recreation to the water for the springs, rivers and rice fields below. Lush pine forest seems to create freshness in the air. Bedugul is known for the quality of its fruit, vegetables and flowers. The mountain resort of Bedugul, 18 Km north of Denpasar, is known for excellent golf course. Located besides Lake Bratan, it is surrounded forested hills. A beautiful sight is the Ulun Danu temple which sems to out of the lake. The area offers good walks. Boats are available for was skiing and parasailing. The temple of Taman Ayun in Bali's Mengwi district, has long been well known as a tourist attraction and is about either kilometres from Denpasar on the road to Singaraja via Bedugul. In the most external one there is a general purpose hall which is used for religious ceremonies and for staging of dances. Close by is a decorative fountain. In the central grounds is a building called the 'bale pelik' with beautiful carvings with interesting reliefs and statues of the nine gods. Dewa Nawa Sanga. In the innermost court, there are twenty nine buildings which function as places for the gods and goddesses.There are other buildings which house religious regalia used in the ceremonies. There are multi-roofed structures, some of them having eleven roofs called 'meru meru'. The central section is surrounded by a small pond, thus the whole complex is symbolic of the great Mandhara Mountain turning in a sea of milk. Besakih Temple is the biggest Hindu temple in Bali which the local people call Pura Besakih. It owns beautiful view from the top of temple area where we can see the wide nature panorama until to the ocean so that way this temple is many visited by tourists from all over the world. Besakih Temple is located in Besakih countryside, Rendang sub district, Karangasem regency, east part of the island. It is located in southwest side bevel of mount Agung , the biggest mounts in Bali . It is because pursuant to Agung Mount confidence is holiest and highest mount in Bali Island. Sangeh is a small fertile monkey forest dwelling by the group of monkeys. It is located in Sangeh countryside, Badung Regency, north part of Denpasar town. It is one of tourist destinations in Bali which is strategically located beside of the road. The good road has been provided to reach this place and many tourists has come to this place to see the cute of monkeys. Sangeh is the village whose northern part covers about 14 hectares of a holy homogen forest of Pala trees with hundreds of monkey in habitants. The trees cannot be found on any other part of Bali and their existence in this village remains a mystery. Look for a lovely mossy temple, which is hidden amongst the tall and gracious "Palatrees". Gua Lawah or Bat Cave is one of favorite places of interest in Bali and it is located near of hilly bank so it is called reef of Middle hill. This cave is located in Pasinggahan countryside, Dawan sub district, Klungkung Regency, east part of Bali and about 1,5 hours from Denpasar Town. There is a nature cave dwelt by thousands of tail bat located at north side from Jeroan/center of Gua Lawah Temple . Meanwhile the main road from Klungkung to Amlapura is just in front of the temple. This cave is apposite to the beautiful beach with black sand along the coastal area. Welcome to Kerta Gosa at Klungkung Semarapura Bali which is one of the famous tourism destinations in Bali and many visited by tourist everyday. Kertha Gosa is located in the heart of Semarapura town and it's name is taken away from a Sanskrit namely Kertha which is meaning Peaceful and Gosa from the Gosita word mean announcement. Thereby, the word's meaning of Kertha Gosa is a building of a kind Jurisdiction in form of Bale for the king who announces the legislation, jurisdiction, penalization etc. The building of Kertha Gosa is very unique and full of high art value so that this place is a unique place to visit in Bali. Ulun Danu Temple is a Balinese Hindu Temple located at Candi Kuning countryside, Baturiti sub district and Tabanan regency. Its distance from Denpasar town is about 50 km north side the way from Denpasar to Singaraja. It is set at lakeside of Beratan with beautiful lake view and hills surround it. It is situated in the plateau area with cool atmosphere surround it and hills as a backdrop. We can find at north side of this temple is Pucak Sangkur mount, in the eastside there is Beratan Mount which also referred as Pucak Mangu or Pucak Pangelengan, in the south side there is Terate Bang Mount and in the Westside there is Tapak Mount and Watukaru Mount. Welcome to Ubud Monkey Forest. Wanara Wana or monkey forest in Ubud located about 1 km from center of Ubud Village, precisely located in the region of Padang Tegal Village and from Denpasar Town is about 24 km. The road condition to reach this place is very good and can be reached by any transportation type about 50 minutes.Ubud Monkey Forrest is occupied by 200 monkeys, pertained to long tail inclusive macaques or macaca fascicularis group, own the wide disseminating area. Among the amount above, about 23 are adult male, 79 are adult female and 98 still baby. All the monkeys in this forest consisted of three groups, occupying certain area and use the certain place and certain time. Goa Gajah (the Elephant Cave), is located in a steep valley just outside of Ubud near the town of Bedulu. Built at least 700 years ago, the cave was rediscovered in the 1920s and fully excavated 30 years later. The entrance of the cave, with its menancing face. You can make out the profile of an elephant if you look at the face's hair; the elephant's trunk is hanging over its ear to the right.